The impression the overall look of the bag provides is one of masculinity. The emboldened ‘Ultimate’ and the cracked flavour colour coded rock wall design hints at 'man marketing'. There is a graphic of a Crisp in the centre. The rest is all a bit corporate and bland – it amazes us how the bigger the company the easier they are persuaded by bland and unimaginative designs by expensive design companies. These Crisps crunched through like crackers rather than Crisps. It was hard and firm, just like the texture suggested they would. Although the crunch was satisfying and impressive, it was not like a natural or expected Crisps like crunch. Thick, meaty and large, these Crisps featured industrial sized squared off grooves that were reminiscent of roofing material. As there were no oil boil they looked heavily manufactured rather than fried. 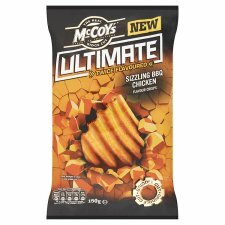 There was a gentle to dark orange seasoning on all of the Crisps. A Nose Plunge Test revealed a spicy Vinegar sort of aroma. The flavour bore very little resemblance to Chicken, but there was a mild and flavoursome spicy taste that while not hot exactly, it was definitely balanced very well.